Universidad Francisco Marroquín designed a catalogue to accompany the exhibit. It provides a “dictionary” of the symbols and guides the reader, literally step by step, along the conquerors’ footsteps. 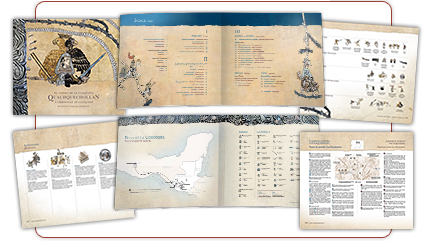 The interpretation of the pictography and illustrated scenes is based on the bookConquered Conquistadors, by Florine Asselbergs, and on subsequent research carried out by members of the Explorations on History project atUniversidad Francisco Marroquín.